This CD contains audio drama for the Haiyore! 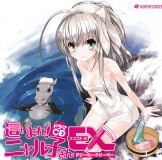 Nyaruko-san novel. This is the second drama CD for Haiyore! Nyaruko-san. This CD came out before the TV anime, and the cast is slighty different from the TV anime. The cast is as follows.